It would be safe to say that the kitchen is the heart of the home. Besides its practical function as a place for preparing and cooking food, it can be a space where family members and friends bond. However, as with any room in the house, it becomes old and tired over time. And, when that time comes, you would need a kitchen makeover. 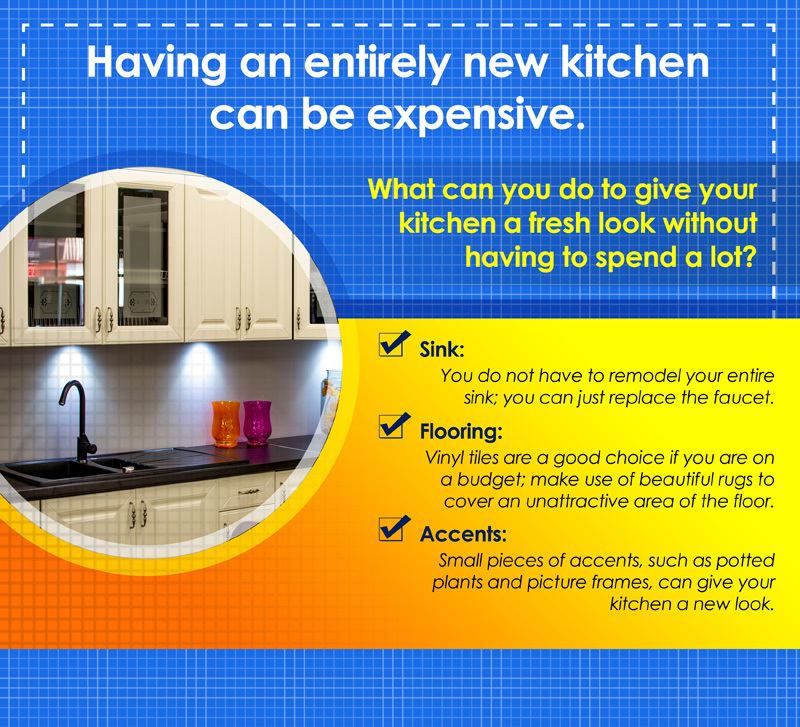 Having an entirely new kitchen can be expensive, though, and you may not be ready for it. So, what can you do to give your kitchen a fresh look without having to spend a lot? Here are some ideas. Do you think you need new cupboards? Well, building new ones would require you to spend more money, so what you can do is painting it. Or, you can just replace their doors, especially if they are damaged. When done properly, you will see the difference it makes; you will have a fresh looking kitchen at a lower cost. Another element in your kitchen that you think may need some remodeling is the sink. You do not have to remodel your entire sink, though. You can just replace the faucet. There is wide range of faucet styles to choose from, and getting one that suits well with your sink can make your sink look new without having to replace it entirely. If you think you need to replace your kitchen floor but are on a budget, then vinyl tiles are a good choice. Although they are relatively cheaper than other types of tiles, they still look great. You can also add some creative touch to it by making mosaic patterns. However, if the floor is still in good condition, you do not need to replace it. You can just make use of beautiful rugs to cover an unattractive area of the floor and to add a fresh look to it. Small pieces of accents can also give your kitchen a new look. These accents do not have to be expensive, though. They can just be in the form of potted plants, photo frames, or pictures of flowers or fruits. In summary, you get to have a fresh and new look for your kitchen for a lower cost. Instead of replacing entire cupboards or sinks, you can just replace the kitchen cupboard doors or the faucets. Or, you can just add some inexpensive accents to your kitchen such as potted plants and picture frames. Having an entirely new kitchen can be expensive. What can you do to give your kitchen a fresh look without having to spend a lot? Cupboards: You can just paint them or replace their doors. Sink: You do not have to remodel your entire sink; you can just replace the faucet. Flooring: Vinyl tiles are a good choice if you are on a budget; make use of beautiful rugs to cover an unattractive area of the floor. Accents: Small pieces of accents, such as potted plants and picture frames, can give your kitchen a new look.